It's been called the pinnacle of the sixties 'love' movement and is also well regarded as the biggest musical moment of the modern era, now Woodstock has finally come to a full digital format. 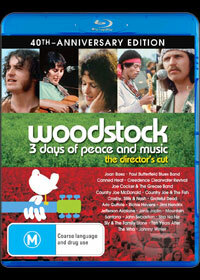 Filmed around the three days of the original Woodstock music festival, the film is in its fortieth year and now looks better than ever. Delving in with interviews from residents as the homage make their way through the sleepy New York state town, to scattered discussions with organisers such as Michael Lang. It follows the artists, the stories and the progress of the festival with all the dramas and uncertainty of performing slots, a barrage of extra people, and the weather elements. The key to this documentary though is it's fly on the wall ability to tap the festivals true emotion. Instead of having a voice over chattering and forcing a direct point of view upon you, it stands back and just asks questions of the people that make the event happen. Roaming from simple ambience shots they will fade into a rapid fire of crowd action and multiangle performance reels. It gives a realistic view into what Woodstock was really like. Being that this film was filmed forty years ago is a wet crowded muddy field, it's no surprise that even with restoration to 1080p, the quality is still not great. There are still cracks, grains, hairs and movement, but no amount of digital restoration will repair that. Also due to the shooting methods at the time, a large portion of the footage still contains the black borders of a 4:3 image, but with up to three pictures roaming multiangle at once you barely have time to notice. If you compare the original release to this current disk, you can spot a vast improvement. The audio is again restored to Dolby 5.1 and it has made a surprisingly large difference, obviously remastered, the 5.1 has allowed a clear separation of the low and mid tones that plagued the original release and made poor some great performances. The new mix has some great immersive quality's and during the more crowd focused scenes you can really experience the surroundings. The high hertz range still sounds a little on the pitchy side but it is so small the majority of people won't notice at all. This is a truly great film and deserves to be restored to the best that technology can. Although the standard edition comes with no special features, it is BD-Live compatible, granting access to a exclusive media centre with downloadable content. This is now the best quality vision of Woodstock since the performances went out live and despite such archival footage, the restoration has worked its charms. The innocence portrayed by the film makers subject she's a brilliant charm that will shock and surprise most people who presumed Woodstock was just about drugs and hippies, and if anyone is considering visiting a music festival this summer festival circuit, I suggest watching this film and trying to find out where we went wrong, it really is a eye opener.